This week I received an unexpected delivery. The parcel was send by Mushkin Europe... I expected some new rams or a power supply, seemed I was in for a nice surprise. The package contained three white 1 liter cans. There was not much info on them, besides Extreme Performance and some technical mumbo jumbo concerning the mixture of the cooling fluid. Got your attention ? If so Read on.. if not read on too! Here are some piccies of the canisters. Mushkin confirmed me these are early samples and the retail package would differ. The fluid however is consumer ready. Main thing I look for in a water cooling fluid is the NON ELECTRICAL CONDUCTIVITY. 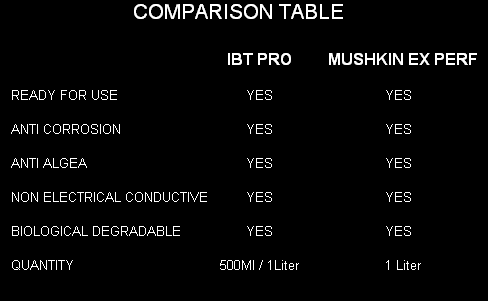 Both products almost guarantee 0% conductivity which is good for my faint heart. Even though I only had one leak in the last 2 years, the Protect IP didn't do any damage to the graphics card. The rig was up and running and I wasn't aware that I had a cut in one of the tubings (just above my Gfx card) When I noticed abnormal behaviour ( due to a too hot CPU ) I shut down the system and spotted that the case bottom was completely soaked. Too cut a long story short, leakage, GPU soaked, GPU still alive : think you get the idea. I was gonna ask the same thing. Looking at the can, I almost thought Mushkin entered the energy drink business. It must give your overclock wings!